. :: EXCELLENT DANTE STAKES SECOND FOR BENBATL ::. 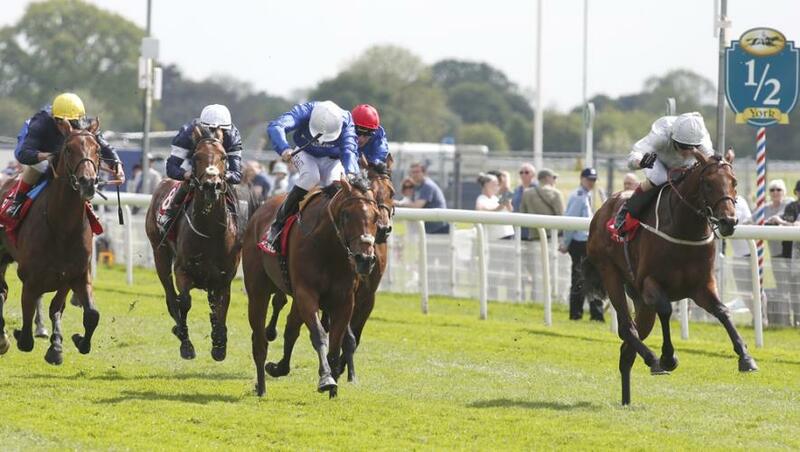 Benbatl ran on gamely to finish a close second behind Sheikh Hamdan bin Mohammed Al Maktoum’s Permian in the G2 Dante Stakes - the leading trial for the Derby at Epsom Downs - over an extended 10 furlongs at York, UK, on Thursday, May 18. The Saeed bin Suroor-trained colt raced in second early on before settling third behind two other Godolphin runners, the free-racing Swiss Storm (David Elsworth/Jim Crowley) on the outside and Wolf Country (Charlie Appleby/William Buick) who set a strong gallop for the 10 runners. Benbatl regained the runner-up spot after entering the straight and quickened up for Pat Cosgrave to press for the lead with over two furlongs remaining. He held every chance as Wolf Country began to fade soon after and Permian went to the front. Benbatl ran on inside the final furlong to go down by three quarters of a length to Permian, who won in 2m 8.40s on ground described as good to soft, soft in places. Crystal Ocean came home half a length back in third, with Wolf Country taking fifth as Syphax (Kevin Ryan/Jamie Spencer) and Swiss Storm finished seventh and ninth respectively. John Ferguson, Chief Executive & Racing Manager of Godolphin, commented: “The great thing about the Dante was that it was a genuinely run race. “William was keen to make it on Wolf Country, which gave Franny Norton an opportunity to sit in behind on Permian, which he did and his horse relaxed beautifully. “Wolf Country is going to be a good stayer in time but he didn’t quite have the gas in the last couple of furlongs. Permian finished the race off really well, with Benbatl at his girth the whole way down the straight. “I am delighted with the first two and I have spoken to Sheikh Mohammed. He is also delighted and very keen that Permian is supplemented for the Epsom Derby (G1, 1m 4f, June 3). .